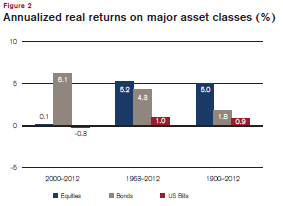 Are equities a good inflation hedge. Certainly the Chinese sharemarket has produced very poor real returns since the 1990s…so much for economic growth contributing to sharemarket growth. Over the last 112 years, shares have outperformed bonds by only 3.2%pa…that certainly compounds to a massive difference but I’m guessing its way below the expected outperformance many advisers or clients expect to receive for accepting the additional sharemarket risk. 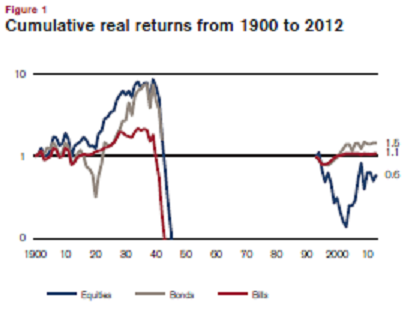 Oh yeah, and I’m being positive from this graph because over the last 50 years that outperformance was only 0.9%pa … albeit bonds have had a great run which I’m very confident cannot continue for the next 50 years.